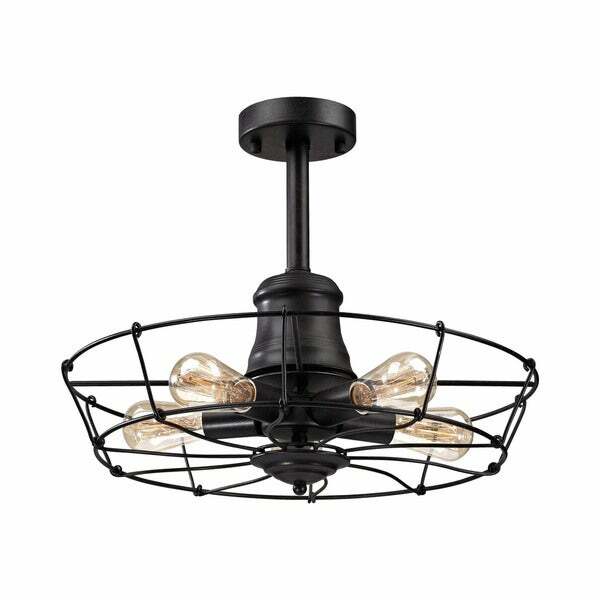 Resembling an antique fan, this classically inspired semi-flush is surrounded by a wrought iron black finished metalwork. Optional filament bulbs enhance the period authentic attributes. This light is even more impressive in person. Everyone comments on them. I put two in my pantry. I purchased the old vintage looking edison bulbs and it really completes the look. The only drawback on this light is the bulbs. If you go with the older looking bulbs, they put off a lot of heat and they also cast a yellowish glow to the room. My pantry doesn't have any natural light, so paint colors etc, had to be carefully thought out. I wouldn't change them, they are that awesome looking. Love this fixture! So unique and exactly what you see in the photo. A wonderful addition to my office. Gives off lots of light! This was on sale, 20% off. With my Club O membership, I was able to get this for a screaming deal. We are adding it to our TV room for our boys, gives a great feel and style to the room! "Does this have a remote control?" No, it does not have a remote. It needs to be hardwired in, so you will turn it on via an electrical switch. "Can this light be installed on a sloped ceiling? Can a longer downrod be used if necessary?" The fan cannot be hung on sloped ceiling.